The Other Side blog: The Doctor is In! Yesterday the BBC announced who will be replacing Peter Capaldi as the next Doctor. If you have not seen the "reveal" video, here it is below. So the new Doctor is Jodie Whittaker. I have seen her in a couple of things, but she is most known for her role as the mother of murder victim Danny in Broadchurch. When I saw her name pop up as a potential casting my first thought was that it was an inspired choice, but not one that could obviously happen. Well, I am happy to say I was wrong. I saw the video yesterday and was quite pleased. Jodie Whittaker is fine actor and will bring something new and exciting to Doctor Who I feel. The Doctor and I go WAY back. I can remember being one of the only people in my Jr. High and High School that knew of Doctor Who, let alone watched it. It was in Jr. High that I was introduced to the Timelord in his guise of Tom Baker back in 1982-83. Of course, we were getting these on PBS back then. I'd stay up on Sunday night at 10:00 pm CST to watch Tom Baker's exploits on KETC from St. Louis. Later I learned that the Champaign-Urbana PBS station was showing a DIFFERENT Doctor. VHS tapes of shows copied in nearby Springfield IL were making their way to us. So in high school, I learned the most amazing thing. The Doctor REGENERATES! Later, much, much later, I introduced my wife to the then brand new Doctor Who with Christopher Eccleston and she was hooked. 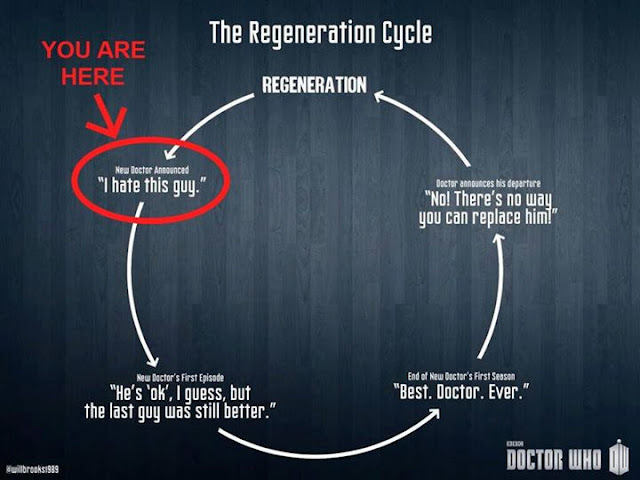 I knew he was going to regenerate at the end, but did not tell her. She freaked out, but soon she became a fan of David Tennant and the rest is well history. And the future, because now I have a house full of Who fans. The point I am making is we have all been on this path before. We are getting the "normal" gripes of "why does the current guy have to go?" Those are expected and really part and parcel of being a Who fan. I don't want Capaldi to go. 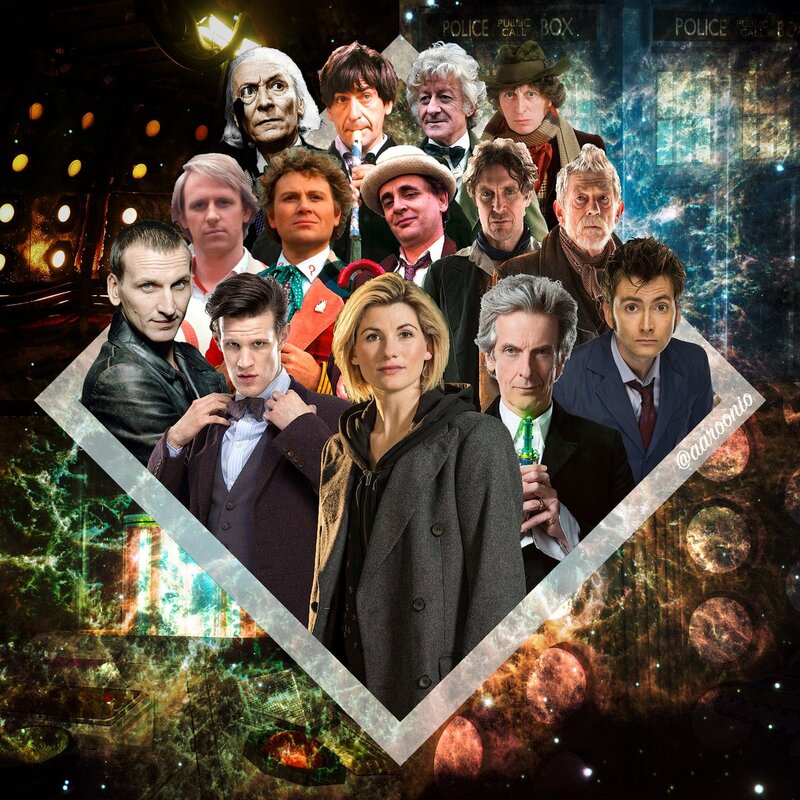 I didn't want Smith to go, or Tennant or Eccleston or any of the others. But this time we are also getting other gripes, and sadly these are also expected. I am not going to link out, but just hit Twitter, or the discussion board of any Who or BBC related website. Like it or not Jodie Whittaker IS the new Doctor. Frankly, I think it is great and I can't wait for her turn to start. Yes. I am going to miss Capaldi just like I did with all the ones that came before. 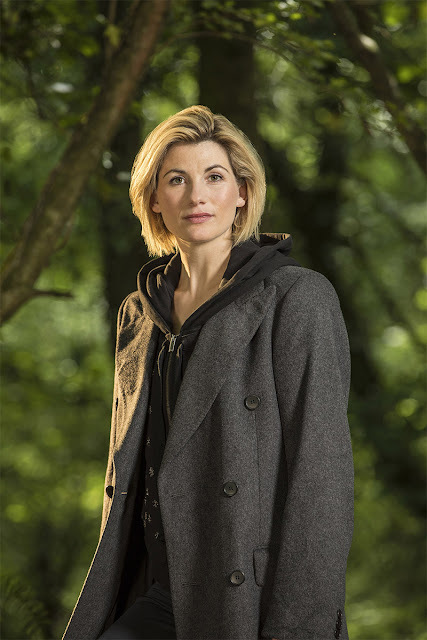 But for now, I am looking forward to this new Doctor.